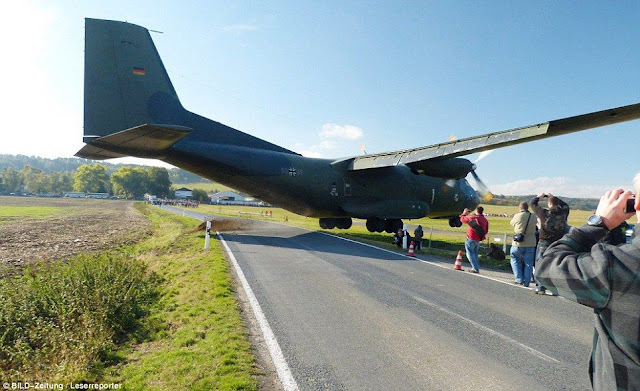 The farewell landing of Transall C-160 aircraft on Ballenstedt airfield in Saxony-Anhalt, central Germany became dramatic when it almost missed a bunch of aircraft watchers. A crowd of about 1,000 had gathered to watch the final landing of a military plane which was about to be decommissioned after many years of service. All appeared to be going smoothly as the Transall C-160 approached the Ballenstedt airfield in Saxony-Anhalt, central Germany. When at the last moments, the pilot suddenly reported he couldn't see start of runway from his cockpit and brought aircraft down on a side road where spotters were standing and they almost ended up being crushed. As some fled screaming in terror, the braver or more foolhardy stood their ground, keeping their cameras trained on the 31-ton aircraft to catch every second of the action. And two of them standing beside a fence post came within inches of being crushed under its wheels. The plane then bounced up in the air, the pilot regained control and landed it safely on the runway. It is unlikely that there will be an investigation into the incident because it was the twin turbo-prop plane’s last flight. It will now go on public display at an air transport museum.